Thanksgiving week is here and more college football to enjoy. I am thankful for a great week of betting last week and hope for another good week to celebrate the beginning of the holiday season. The Thanksgiving night college football game features the (6-4) LSU Tigers vs. (8-3) Texas A&M Aggies. LSU is coming off a loss last week against Florida 10-16 while Texas A&M had a 23-10 win over Texas-San Antonio. LSU needs to get a win this week after their last result, and for this they need Fournette at 100%; he has been suffering of an ankle injury and that has caused problems for the Tigers. Defensively they are doing well, in this game linebacker Kendell Beckwith is not expected to play. Texas A&M has been unimpressive throughout the season and after Trevor Knight’s shoulder injury even more so, the quarterback could be back for the game against LSU and this would be great news for Texas A&M, this though is just speculation at this point. When we compare both teams we have to say this is a very close matchup, with LSU having a better defense than Texas and Texas playing at home. The college football line for Tigers vs. Aggies is at -5 for LSU and a total of 44. LSU to cover the spread and the over on the game. The (10-1) Broncos dominated UNLV 42-25 last week, while (8-3) Air Force edged San Jose State 41-38. This game is scheduled for Friday, Nov. 25. Both teams are good but picking them apart I consider Boise State superior both defensively and offensively. Point spread has Broncos at -9 and a total of 65. Another great matchup between two teams that are currently 10-1 for the season. This game takes place Saturday, Nov.26 at Ohio. The Buckeyes managed a close win 17-16 against Michigan State last week but they have been doing what they need to do to win, not convincing of their superiority. There is special motivation behind the result of this game since the winner will potentially be earning a spot in the Playoffs. Ohio State has won the last few meetings to Wolverines and they have the home advantage. Michigan has an experienced team that is well rounded and strong. Ace Sportsbook line has Ohio State as the favorite at -6 and a total of 48.5, I believe the line is high right now and I will be waiting to see if it goes down or try to take it in a teaser bet. I like Ohio State to win and the over. The Los Angeles Memorial Stadium will host the game between South Cal and Notre Dame. USC (8-3) is coming off a win over UCLA; we can’t say that they made believers of us because they have their good and bad moment, but they’ve managed to make it work. The 4-7 Notre Dame lost to Virginia Tech and needs a win more than ever, yet they are up against the Trojans who are superior in all fronts. Line is high… -16.5 for USC with a total of 57.5. Let’s hope it goes down a bit but I’d still pick USC and the total over. 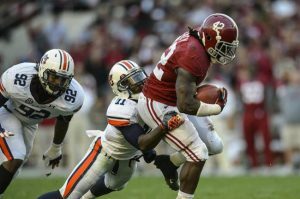 Undefeated 11-0 Alabama will meet 8-3 Auburn on Saturday, Nov. 26 Even considering that Alabama has had a perfect season so far we can’t count out the Tigers who have a good defensive game. The line is high currently at -17 for Alabama.